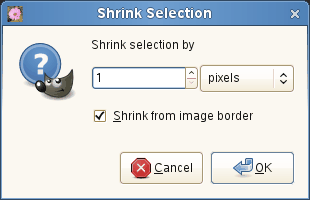 The Shrink command reduces the size of the selected area by moving each point on the edge of the selection a certain distance further away from the nearest edge of the image (toward the center of the selection). Feathering is preserved, but the shape of the feathering may be altered at the corners or at points of sharp curvature. Enter the amount by which to reduce the selection in the text box. The default unit is pixels, but you can choose a different unit of measurement from the drop-down menu. This option is only of interest if the selection runs along the edge of the image. If it does and this option is checked, then the selection shrinks away from the edge of the image. If this option is not checked, the selection continues to extend to the image border.